Fill a large pot 3/4 of the way up with water. This will ensure that the water doesn't spill when it's boiling. Don’t under-fill the pot because this will make the Rice Pilaf sticky. Empty the entire bag of the Uncle Tom's Rice Pilaf in boiling water, stir and cook on high for 2-3 min, add more hot water as needed then cook on medium for 12-13 min or until rice & pasta is fully cooked. Strain out excess water and rinse Rice Pilaf with fresh Hot water to remove all of the excess starch off the rice and noodles. Strain water out again. Mix in (optional) one cup of oil and/or melted butter with desired seasoning. Lastly, mix in a cup of nuts like sliced or chopped almonds, pistachios, walnuts, pine nuts or peanuts and finally add your fresh herbs like chopped cilantro, parsley, mint or chives for color and flavor. Let set for 15 min, mix in your pre-cooked vegetables if desired, serves approximately 24 servings. 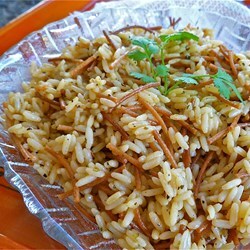 There are many variations that can be tried using our bulk Uncle Tom's Rice Pilaf. Starting with the type of oil used in your Vegan Rice Pilaf. Giving it a different and unique flavor every time. How about using melted butter or you could try coconut oil for a more exotic tropical taste or olive oil and add some lemon or lime juice for a more Mediterranean taste. You can also add fresh sautéed or minced onions. Try adding minced garlic to give it a little extra kick. Fresh or frozen vegetables like celery, corn, peas, broccoli and carrots are always in good taste. Or how about Fresh or Sun Dried Tomato's or better yet Fresh or Canned Pineapple from the fruit family? Nuts like sliced or chopped almonds, pistachios, walnuts, pine nuts or peanuts can be added as well and lastly add a some scrambled eggs for more color, flavor and protein. Don't forget about trying different fresh herbs as well like parsley, cilantro, mint, garlic, onion or chives and spices like lemon pepper, saffron, cayenne pepper, paprika as well as salt and pepper. Have fun with it and let us know some of your personal favorite recipes by leaving us your comments below.